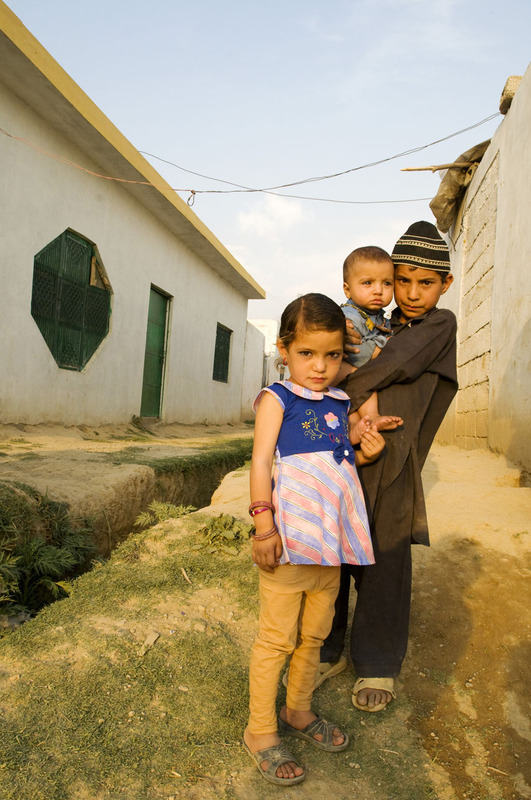 Jafir (far right), 7yrs old, holding his baby brother Kamran, and standing next to his sister Asma (left), 4yrs, inside a refugee community set up on the edge of Islamabad, Pakistan. These children and their parents fled their home in Bajaur 4 months ago and have no idea when they will be able to return. This refugee community that they are living in now was set up by refugee, Bir Baba, also from Bajaur, who was forced to leave his home when the Taliban threated to kill him if he did not leave his village. There are now 70 -80 undocumented refugee families living in the community.